The Grantham Canal is an non navigable canal that runs from Nottingham to Grantham. Because of the shallow water and the lack of boats a lot of the canal is relatively unfishable due to Reed and weed growth, there are however one or two very good sections where the weed growth is not too bad that hold a lot of fish. Without doubt the most abundent species in the canal are Tench, early mornings and late evenings providing some very good sport. Roach, Bream, Perch and Pike are also present. The 350 Yard Stretch between Sander’s Lock and Skinner’s Lock on the members only water at Cotgrave is probably the best section. Sander’s Lock is 250 Yards from Cotgrave Road Heading along the towpath back towards Nottingham. Although quite shallow the area around Bassingfield is also worth a try along with the recently dredged section at Gamston Bridge on Radcliffe Road. Day Tickets are available from Lady Bay to Tollerton Lane and Cotgrave Road to Hollygate Lane. The section from Tollerton Lane to Cotgrave Road is Members only. Night fishing is not allowed. No Closed Season, Open all year. Cotgrave Road section. From the A52 Radcliffe Road Turn into Stragglethorpe Road towards Cotgrave. After ½ mile turn right into Cotgrave Lane and continue for just over ½ mile to where the canal passes under the road. Parking is either in the car park on the right or the lay by on the left. Bassingfield Section. Travel westbound along the A52 for ¾ mile from Stragglethorpe Road and turn left into Bassingfield Lane (Please note that you can only turn into here travelling west i.e. back towards Nottingham). Continue along Bassingfield lane to the junction. Slightly to the right on the opposite side of the road is a gate, go through the gate and down the track to the canal, park in the dip just before the bridge. Bassingfield can also be accessed from Tollerton Lane off the Lings Bar Road. 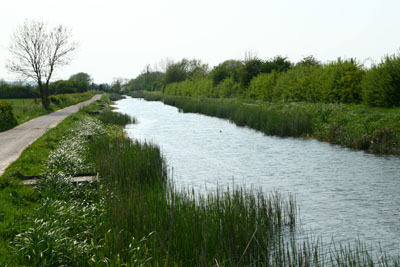 Access to the canal is also available from roads surrounding Lady Bay and Gamston and from Hollygate Lane at Cotgrave.